to consider interests and requirements of involved member states in an appropriate way. in conducting all important steps of JPI implementation such as developing Strategic Research Agenda and related matters. The Management Board may decide to form Taskforces (TF) around specific themes and monitor their progress. The TFs will consist of countries, which will voluntarily cooperate around a specific topic. To date 4 TFs have been established for the implementation of joint actions and issues related to the data sharing and results dissemination. 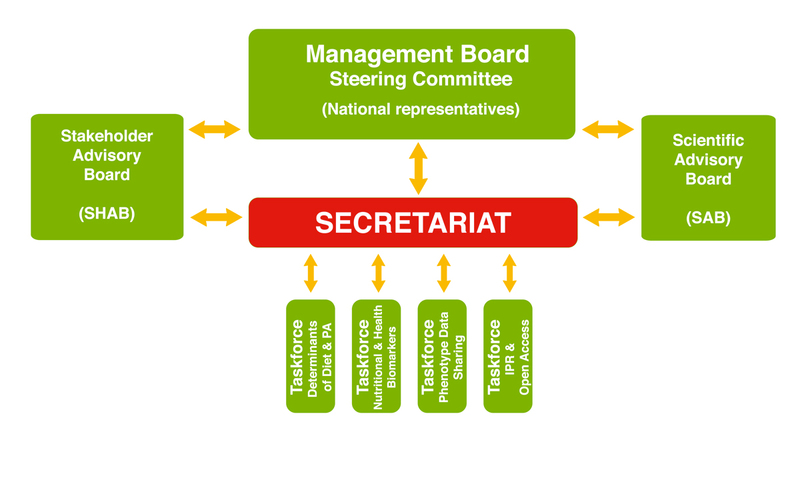 More recently the Management Board has decided to improve the governance structure of the JPI setting up a Steering Committee (SC), made by the MB chair and vice chair and two delegates of voluntarily participating countries. The SC will support both the MB and the JPI Secretariat in the implementation of the JPI HDHL action plan and its related decision process. The Secretariat organises the day to day management of the JPI and implements those tasks foreseen in the Coordinated Action supporting the JPI HDHL (CSA), granted by the EU Commission.